Finally I post this. it’s about time. After all, it’s been almost a month since I made it, and it was enjoyed by a few of us over one long weekend of Memorial Day-barbequeing, birthday-celebrating, and general merriment. My mom and my sister were in town, and those are my two very best friends in the world. Except for Christmas and our annual trip to Florida (which we affectionately call “summer camp”), we’re not typically in the same place at the same time. This was a happy exception, and it called for a happy cake. A happy, three-layer, sprinkle-laden, crumb-filled-and-topped cake, frosted within an inch of its life. Because that’s how we celebrate around here. 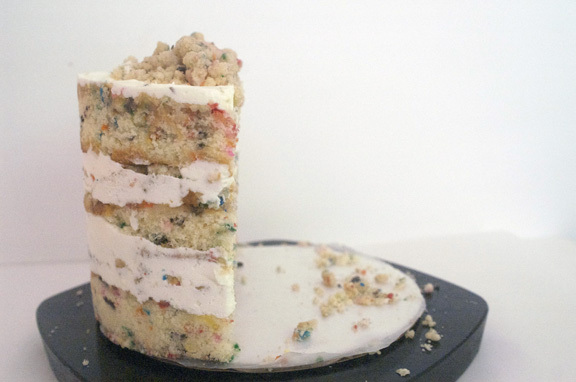 This is the Momofuku Birthday Cake. This is the cake my sister picked out the minute, and I do mean the minute, I opened this book up over the Christmas holiday. Mom was the one who purchased it for me, so it was only appropriate that I make it as a birthday gift for my sister when my mom was also in town. We did not know then that this book would change my life a little bit: it has made my baking more adventurous, taught me things I never knew before about flavors and techniques, and is largely responsible for giving me the confidence I needed in myself and my baking abilities to attempt things such as this. All from one little book, I know. But books can change your life. I broke in the cake section back in May with the carrot layer cake. I was nervous about that one; first times, you know how they are. But as with the cookies, once you do the first one, you sort of understand the rest of them, because they involve the same basic steps. Since we discussed the step-by-step assembly with the carrot cake (and don’t worry, it’s included below in the recipe as well), this time I wanted to give you some random tips for this one to help you along the way. 1. Crumbs are multipurpose, so make extra. 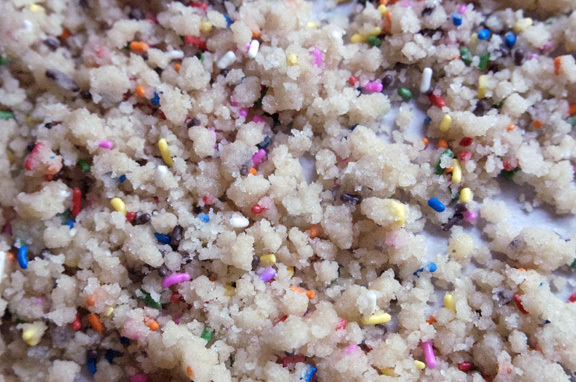 Hey; you’re already going to the (hardly any) trouble of making a batch of these lovely crumbs. Why not just make a double batch? It’s not like some baked goods, where if you double it, it starts turning into Michael Keaton’s character in Multiplicity. The crumbs don’t get stupider, and nothing goes wrong; you simply have more crumbs. 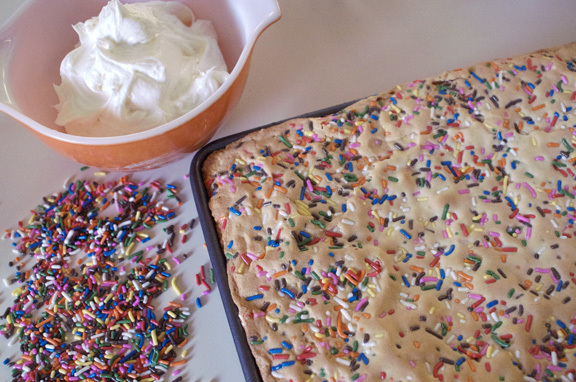 You can spread out a double batch easily onto a lipped half-sheet pan. And sometimes having extra on-hand eases the tension a little when you’re stacking these layer cakes: you’re not going to run out, so use more crumbs if you want. What’s left over will store well, or can be used for cookies. And snacks. I myself have found that crumbs have healing powers and that eating them whilst making something with them actually makes the thing you’re making better. true story. 2. Don’t be afraid to customize. A little bit. 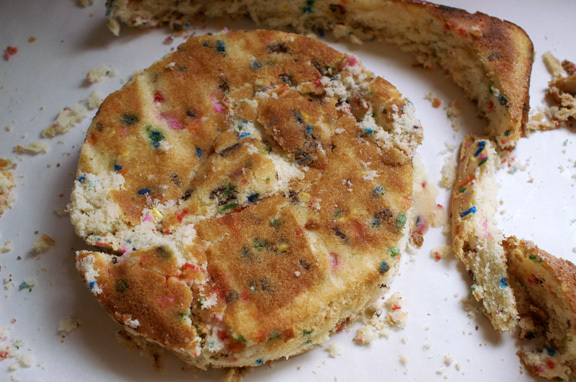 Know what you’re doing, and don’t just go throwing things in, but do I add extra sprinkles? Yes I do. Because that’s the way I like it. Are you salt-sensitive, or find that the Momofuku recipes you’ve made already taste salty to you? Cut down the salt a bit (although this cake, I’ll warn you, is not one I would say I noticed a big salt component.) If you really have something against clear imitation vanilla extract, then go for the pure vanilla extract, just know your color will be altered slightly. This is about you and what you want in a cake. It shouldn’t be scary to make adjustments. 3. An overdone cake tastes like an overdone cake, period. Just remember that no amount of luscious frosting or sprinkles can correct what carelessness gives you. I’m not trying to beat you over the head with it or sound harsh, but cake is special, and temperamental, and a little bit fussy. It can dry out in a minute if you’re not paying attention, so by all means, pay attention to it. Give it the coddling it deserves; after all, it’s going to be a towering beauty of delight soon enough; don’t mess it up by walking away from it. I always suggest a peek-in time well before it should be done: it’s a great way to gauge where your cake is at and how your oven is doing, so do the peek-in, test it out, and determine from there how long you have to go. After the peek-in time, I never leave the kitchen. You think I’m crazy, perhaps, but I’ve learned my lesson (several times) the hard (dry cake) way. 4. Believe in the power of uncooked shortening. I didn’t until this cake. I had tried a few recipes with a frosting made with shortening and it made me cringe a little bit. I rushed through them, got them wrong, and hated them. But I was determined to make this cake the way the book said, and if that meant I tried shortening again, by golly, that’s what I was going to have to do. So to those of you who hate vegetable shortening, and who are already altering the frosting recipe in your head because you can’t abide the idea of it, stop right there. Because I was in your boat. Now I’m in the shortening boat, and it’s all because of this light, crazy good, perfection of a frosting. If you ask me, all frostings should be made using shortening if this is how they will end up turning out. 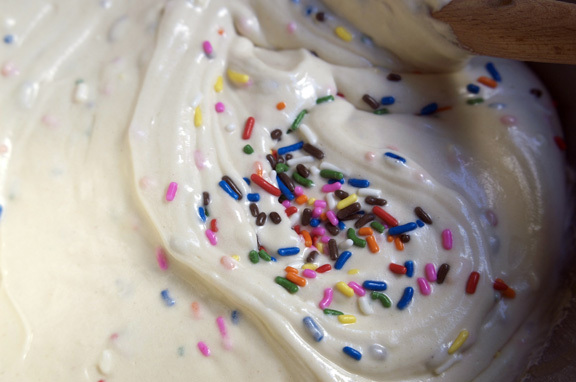 Simply put, Best Frosting Ever. Please, shortening haters, just this one time. Try it and you’ll see. 5. Don’t let the cake ring cutouts frustrate you. This is one of the parts I know will frazzle some of your nerves. I’m guessing it will be those of you who really like a tidy dessert. A smooth, polished look. This cutout process? This has the potential to do you in if you don’t tackle it with confidence. And I know if I can do it, so can you. Here’s how to not get nervous. First, scroll back up to that top photos of the finished cake. See that? That’s the end result. Now look at the photo directly above this paragraph; that’s what it started as. A crumbly, bumbly, cake wreck. And that’s how it is. Want to see something even more frightening? Wait; what’s that hiding in the background there? It can’t be…there’s no way that’s what you think it is…but it is. It’s the bottom layer. That right there, that circle of cake which looks like I dropped it on the floor or played a game of Fling the Pastry with it, is one of your layers. Don’t be alarmed. If you remember what the finished cake looks like (scroll up as needed), you know everything turns out fine. In the interest of instruction, I actually pieced this cake together inside the ring, removed the ring, took this picture to show you, and then put the ring back on. And it STILL WORKED. Trust yourself. You’ll have enough cake pieces to make the ring, it won’t fall apart, and it will look just gorgeous when finished. Even when you slice into it, skeptics. But we’ll get into that later. 6. Squeezie bags are nature’s answer to stressful layer-caking. And by “nature” I mean whomever invented plastic, and subsequently whomever invented the plastic storage bag. 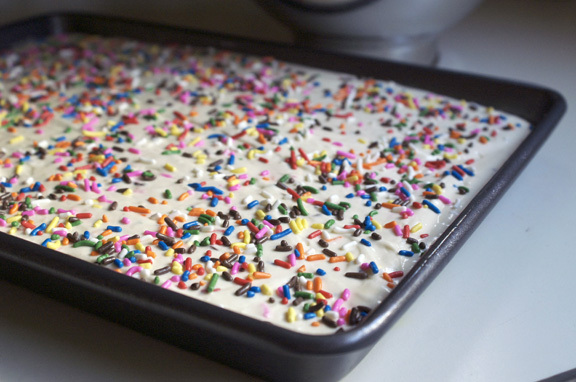 If you want to expend time and tears trying to gingerly spread frosting over what is basically cake gravel, be my guest. There’s a better way, and that’s the squeezie bag method. Simply fill a gallon-sized plastic storage bag with your frosting, cut a hole out of the corner, and off you go. For big projects like this, I cut maybe a 1/2 to 3/4 inch hole, and it works very well. To show you how easy it is, and how to do it, I’ve made a how-to above. 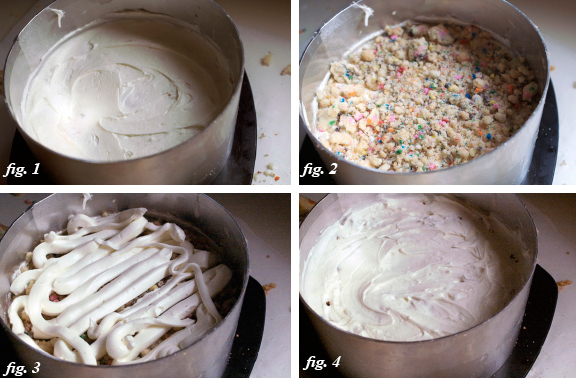 Figure 1 is the frosting spread over clean cake; no biggie. 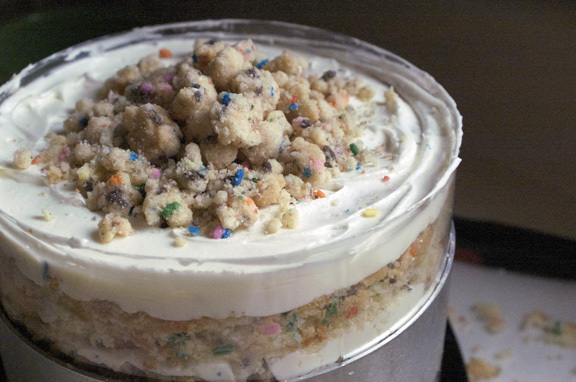 Figure 4, which looks very similar, is the frosting over the crumbs using the (figure 3) squeezie bag method. It will make your life easier, at least in this regard. 7. Don’t skimp on freezer time. This cake needs some time to itself to meld together and form the perfect union of creamy frosting, vanilla-scented cake soak, and sprinkle cake. Let it be. I find that with these cakes, I make the crumbs the day before, then the cake in the morning so it can cool, and the frosting while the cake is cooling or right before I’m ready to assemble. This puts me at late afternoon for cake assembly, which is terrible for photos (sorry!) but terrific for cake chill time, especially if you’re having the party the next afternoon or evening. 8. 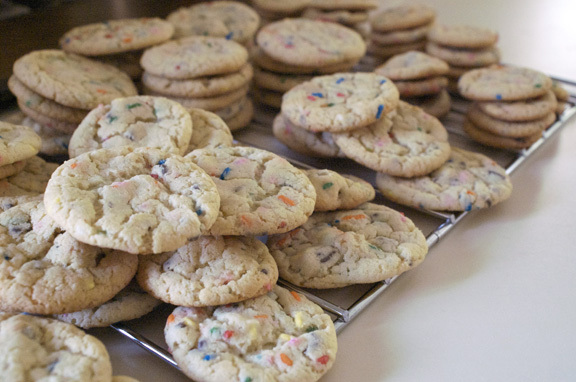 Why not randomly make some cookies while you’re in the kitchen. You already have your crumbs made, right? And I’ve left you with a full almost-24 hours to sit and wait to taste this cake. As you can see, you have no reason not to make cookies. You could make giant ones to use as plates. make tiny ones to decorate the cake with, stick in the top of each piece upon serving, or just go next to as a side dish. These cookies freeze very well, so when that cake disappears (and it will) you have cookies to remember it by. I can tell I’ve convinced you; the recipe is right here. That’s what your cake will look like when it’s ready for some freezer time, by the way. Remember your freakout about the bottom layer? Can you even identify that pieced-together part now? 8. Milk soak is a wonderful, glorious thing. You know, before I began cooking and baking for you, I had seen random mentions of “soak” or something having to do with liquid on a cake, but I paid no attention. Why would I want to douse perfectly good cake with milk? Here’s why. 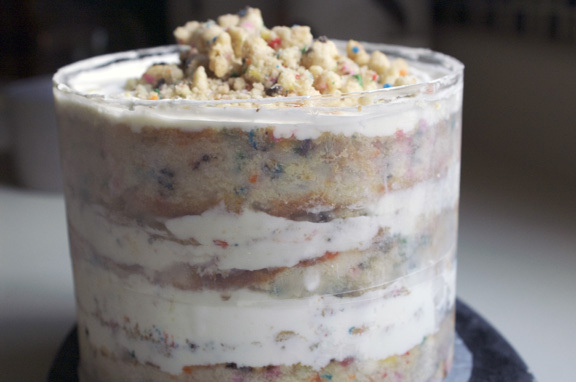 First, it’s practical, because in this cake, you’re basically gluing the bottom layer together. Frosting isn’t going to do that for you; it can’t get into the crevices. The milk can. 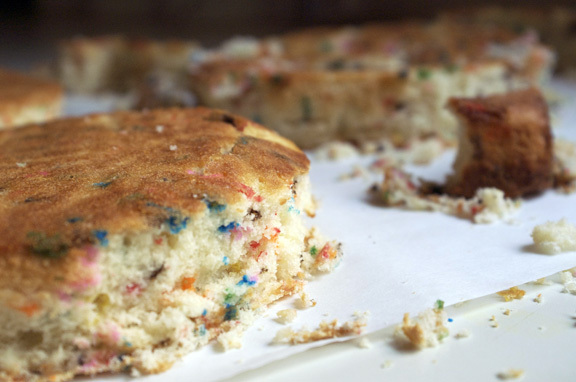 Second, it enhances the texture of the cake, turning it from frosting/crumbs/cake into a rich, moist, singular thing. Don’t skip it. I wish I could threaten you with what happens if you do skip it, but I wouldn’t dare spend this much time crafting a cake only to have it destroyed by knowingly neglecting something. And there you have it. This was after the first round of eating. I didn’t have much time to take pictures. Adapted hardly at all, because it’s brilliant, from the Momofuku Milk Bar cookbook by Christina Tosi. Because she’s a genius, so why change things too much. Did anyone decide to adapt Einstein’s cake recipes? No. I’ll direct you here for the crumbs: there’s going to be enough words without me muddying the waters. the crumbs are easy. 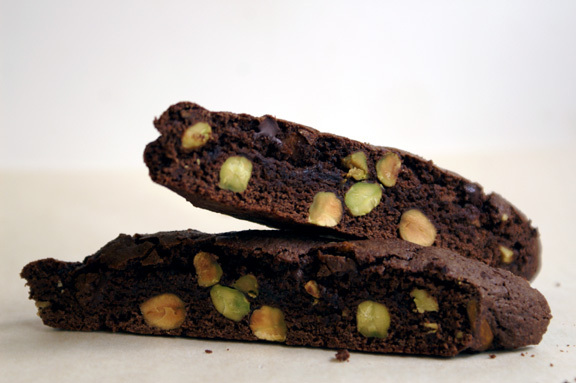 Please make a double batch if you feel like you’ll want extra/want to make cookies/want some to snack on as you work. I always do because they store very well/I want to make cookies for no reason/love crumb snacks while I work. As I said before, i’ll refer you to this post for the crumb recipe and ingredients. Watch them carefully so as not to overdo them; you don’t want a dry crumb, so lean towards underbaking rather than overbaking here. The crumbs do tighten up once cooled. Preheat the oven to 350˚F. Grease a lipped quarter sheet pan (either 9 x 13 or 10 x 13, both will work and it depends on what you have) and line with parchment paper, leaving some paper overhanging the sides. Grease the parchment paper. In a medium bowl, whisk together your cake flour, baking powder, salt and sprinkles. Set aside. On low speed, stream in the buttermilk, oil, and vanilla. Beat for 4-6 minutes on medium-high until the mixture is white, has grown to about twice its original size, and is completely homogenous with no streaks running through it. It’s beautiful when it’s all incorporated, but up until that point, it looks liquid-y, like somehow you made a mistake. You didn’t; keep at it, don’t get frustrated, and keep beating until it is completely combined, scraping down the sides as needed. Scrape down the sides after you’re finished with this part. On low speed, add the cake flour/sprinkles mixture. Mix for about 45 or so seconds, just until your batter comes together. Scrape down the sides of the bowl, being careful to get very bottom of the bowl as well – you don’t want any loose mixture hiding out down there. If you find some, mix again for a few seconds until incorporated. Pour your batter into the center of your prepared sheet pan, spreading it with a spatula to flatten the top and push it out gently to the sides. 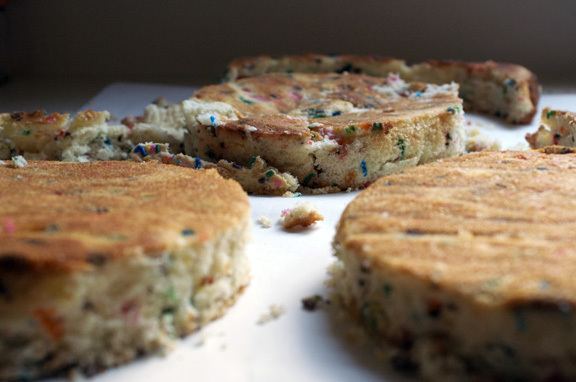 Once it’s all even, sprinkle your remaining sprinkles over the top. cute! Bake for 25-30 minutes, checking at 23-minute mark for doneness. Here’s why I say that: I’ve noticed in cake-making, the same cake cooks very differently depending on what pan I use. Not just size and shape, but also color and non-stick versus uncoated. SO! As I don’t know what pan you’re using, don’t follow my times blindly; please check for yourself, because you want a nice, not-overdone cake. To check for doneness, you should be able have a cake tester inserted in the middle come out cleanly, or the cake should bounce back slightly when you touch it and the center should not be jiggly at all. This particular cake develops a little bit of a ‘crust,’ if you will, on the top, so watch for that as well. I’m not saying it has to, but that began once it was just done. Watch it carefully in those last few minutes to make sure you don’t overbake your cake. Remove and cool on a wire rack (completely, please) until ready to assemble. The cooled cake can be stored in the fridge, wrapped in plastic wrap, for up to 5 days. I cool mine in the pan, but once cooled, I remove it (using the parchment overhangs as handles) and let it sit on the cooling rack, still on the parchment. This will come in handy (pun, sorry) when moving to your work surface. With the mixer on low speed, stream in the glucose, corn syrup, and vanilla. Beat on medium-high speed until the mixture is smooth and glossy white, about 3 minutes. Scrape down the sides of the bowl again. Add the confectioners’ sugar, salt, and baking powder and mix on low speed just to incorporate. Once mixed in, beat on medium-high speed for 2-3 minutes, until your frosting is whiter than white and totally smooth. It should look like shmancy bakery frosting, people, because it is. You just used vegetable shortening in something uncooked, and it tastes PHENOMENAL. Use the frosting immediately or chill in the fridge in an airtight container for up to one week. I like my frosting as fresh as can be, and i think it spreads best at that point. I wouldn’t mind if you made the frosting right before you get ready to assemble; in fact, I recommend it. deep breath…and…exhale; t’s layer time. Prep stuff: have at the ready your cake ring, acetate strips, plastic zipper storage bags, pastry brush, and the thing you’ll be placing your cake on. You can buy cardboard cake boards, or the plastic, more permanent versions, at any store which carries decorating supplies. The cake ring and acetate strips I ordered at Amazon.com. Take your cake, still on its parchment handles, and lay it on to your work surface. Use the cake ring to stamp out 2 circles from the cake (see photo in post). Those are your top 2 cake layers. Using the remaining cake, your creativity, and the cake ring, piece together the third circle (your bottom ring) of the cake. Clean the cake ring and line it with an acetate strip, and place it onto whatever base you’ve chosen to use. PLEASE FOR THE LOVE OF EVERYTHING HOLY remember that this must be able to fit in your freezer once finished. Place Circle #3 (cake scrap circle) inside the acetate-lined ring. Mix together your milk soak, which is just the milk and vanilla. Dunk the pastry brush in the milk mixture and give your cake a good once-over with half the milk. Use the back of a spoon to spread the first layer of frosting evenly on the cake. If you’re nervous about this, don’t be: this is the easy part. if that didn’t quell your fears, use that plastic storage bag technique I mention above (see photos in post). Sprinkle desired amount of the crumbs evenly over the cake.Use your judgement and don’t go crazy if you made a double batch. If you made a single batch, remember you’ll need crumbs for another layer and some for the top. Fill your plastic storage zipper bag with frosting, if you haven’t already, and cut a 1/2 to 3/4 inch hole in the corner. Squeeze evenly over the crumbs (see figures 1-4 of the how-to above). Use the back of a spoon to spread your lines of frosting evenly over the crumbs, using a gentle hand and patience. Congrats! you’ve completed your first whole layer. Moving on. Gently tuck your second strip of acetate between the cake ring and the tip 1/4 inch of the first strip of acetate, so you have a clear ring of acetate 5-6 inches tall-high enough to support the height of the finished cake. Set Circle #2 (either of your remaining circles, the least pretty of the 2) on top. This is nerve-wracking, a little bit. It’s not the easiest thing navigating the circle inside the acetate strips, but you can do it. Go slowly, and think before you drop, trying to disturb the cake layer sides as little as possible. Repeat the whole frosting/crumbs/frosting thing. Settle your final circle (Circle #1! You did it!) on top. Decorate as you see fit: From my above photos, you can see I just did a crumb center. That’s me, however. You do it how you like. 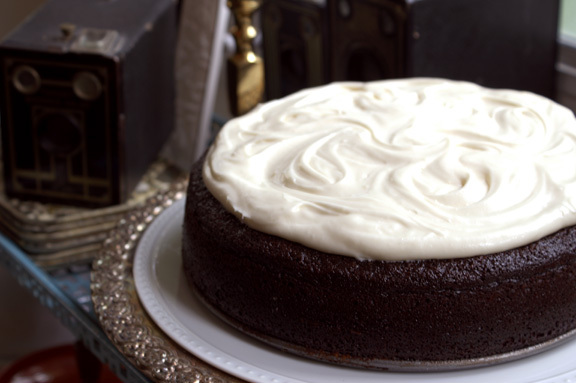 Transfer the cake, on its sturdy base, to your freezer and freeze for a minimum of 12 hours to set the cake and filling. The cake will keep in the freezer for 2 weeks. At least 3 hours before serving, pull the cake out of the freezer and, using your fingers and thumbs, pop the cake out of the cake ring. Gently peel off the acetate and transfer the cake to a platter or cake stand. let it defrost in the fridge for a minimum of 3 hours. Wrapped in plastic, it can be refrigerated for up to 5 days. I couldn’t figure out really how I would do this to the entire cake. If it were me (and indeed, I did this) I would defrost and serve, then wrap the remainder. I wouldn’t risk making this for a big to-do and then having it stick to plastic wrap. YES! We did it again! Go, us. I love you…in a totally healthy but excited way. Have a fabulous beach vacation. May there be sprinkles. love you too! and i will…I honestly wish i could take you guys with me. how much weight would we gain? tons. calendar = noted. we’ll discuss your b-day post. thanks, willow! this cake was especially nice to have work since it was for my sister’s birthday and she was really looking forward to it; nerve-wracking, but i had practiced with that carrot layer cake just in case. 🙂 and it’s funny; my way of writing is my way of talking, so i always feel like it makes it more personal – at least for me – when people say they like my writing. so thank you very much for that. Somewhere in your instructions you mention carrot cake, but this cake is carrot-less, correct? Yesss, I was reading instructions, no, I have no plans in the foreseeable future to make this cake. 😀 Go us… I mean you. i wish i had known shortening was not to be feared sooner than now. I instilled the fear myself, mind you, but i wish someone had told me i was being ridiculous. it’s SO GOOD. i’m now fascinated by it. so, if i fly you to AZ will you make my birthday cake? This is absolute glory. GLORY! You have astounded me. And that’s all I can manage to say after reading this epic post. brianne, i feel thrilled you like it so much. 🙂 i’d be happy to make this for you next year on your birthday. now you go and enjoy your weekend home. thank you, Peter! it is fun…to make AND to eat. Okay. This is my favourite post. Ever. It sums up everything I worry about when baking, and shouldn’t. This post is like the freakin’ cheerleader of posts. I loved every word. It’s been sitting in Google Reader. Waiting. Waiting until I had the time to sit with a cup of tea and savour every word, like nibbling each and every sprinkle on top of a cupcake. 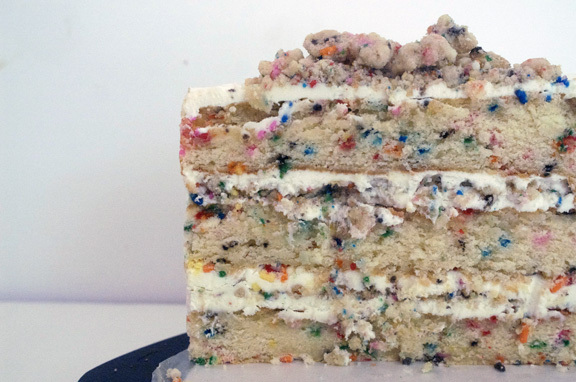 Or, say, a confetti birthday layer cake. Also, I want this cake when you come to visit me by the ocean. noted. movita’s favorite post. and can i say i’m so happy my random thoughts on cake stacking and squeezie bags make your day. i like to make things easy for myself, really, and that’s where these posts come from: my baking heart. it probably gets at what i’ve done all along, even pre-blogging: talk to myself/talk my way through things. thank heavens people actually read it now so i don’t have to feel like the crazy lady who talks to herself while baking. I like being your cheerleader. I will absolutely make ou this cake when I come visit you by the ocean; it’s like the least i could do. If you could bestow upon me in return/drop some of your bread-baking, baking-school knowledge bombs on me, i would love that. thank you for dreaming about this cake with me for 6 months…. and thank you for making this cake for my birthday… and thank you for letting me eat 55% of said cake. Seriouseats sent me here. Normally I don’t comment on recipes unless I have something useful to say (from actually using the recipe), but I feel compelled to tell you that this is the most amazing looking cake I’ve ever seen. If I ever get married I want this. You are very talented! Gotta love Serious Eats for getting like-minded people together over food, right? 🙂 and i’ll tell you what: if you get married, and you decide you still want this cake, you let me know and we’ll figure something out for you. thank you so much, and i’m so happy (and honored!) you like this cake. I to have learned to love shortening frosting. I was absolutely terrified because I had so dreadful whoopie pies with greasy filling. But shortening in frosting is magic. melanie, i read this and gasped; i had the same bad experience! mine was with the malted vanilla sandwich cookies in one of the Baked books; the filling in it was a shortening-based one and i felt like it was inedible (the jury is out as to whether i screwed it up or it really was gross). i threw it out and vowed to never make greasy frosting again. blech (shudder). but now? if done right, i realize it’s indeed magical. and not at all gross. this one being especially magical, in my opinion. Looks amazing and am excited to try it out. Thank you. I want to make the cake for my niece. Where do I get the acetate strips? hi marie! this is a great cake, and well worth the effort! i hope you and your niece love it. you can get the acetate strips at Amazon.com, and they do come in larger packs (like a restaurant supply), but i use them all the time, so they are a decent investment if you like this style of cakemaking. here’s a link to the ones i have, but feel free to browse around the site: search under “acetate strips” or “cake collars,” or if you have a local kitchen specialty or restaurant supply store open to the general public, you may want to call them. This cake and method is so inspired! I had to do some hunting to find the assembly but so glad I did. I also went to youtube and there is a video of Christina Tosi putting together a similar cake and that along with your meticulous instructions helped me ease my mind. I will be making this baby and I just can’t wait! Hi Marie! Sorry for the crazy delay in responding: i had totally missed seeing this. It’s a 6-inch cake ring, which can be ordered either on amazon or found at Sur la Table, if you have one where you are. They have all different sizes, but what you see here is three six-inch layers. hope that helps! One question, is the milk soak to only go on the bottom 2 layers, or the top layer as well? I only put it on the bottom two since I wasn’t sure and am hoping the top layer will not turn out dry because of it. Thank you for tips, tricks, and encouragement! Hello, Felice! I’m so sorry to just now be seeing this: I hope you figured this one out. I too am completely obsessed with the momofuku cakes, and i’m happy you liked the tutorial/instructions on this! It was hard the first time trying to really get through it, so any help i can give to others who attempt these cakes makes me happy. So the milk soak: only on the first and second layers. 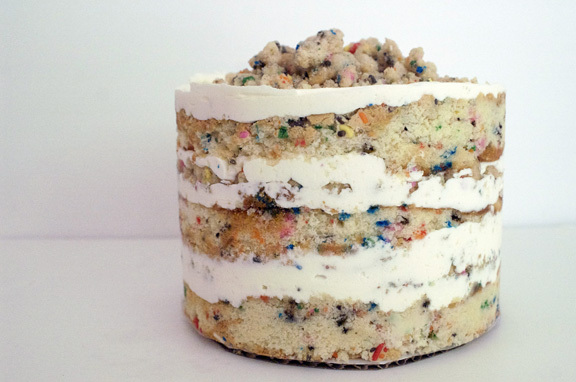 the top layer is the frosting and any confetti crumb you decorate with. This seems to be enough to protect it and keep it from drying out: i’ve made this cake 4 times now for various parties, and i’ve never had a problem with the top layer being any different from the soaked 2nd and 3rd layers. Hope this helps (albeit it late, but maybe for future cakes? ), and it’s nice to meet you. Hi! Thank you so much for your reply! The cake turned out fantastic. My friend coined me ‘the cake sorcerer’! I would have let it defrost a smudge longer than 3 hours, probably 4-5 next time, but was still delicious in every way. 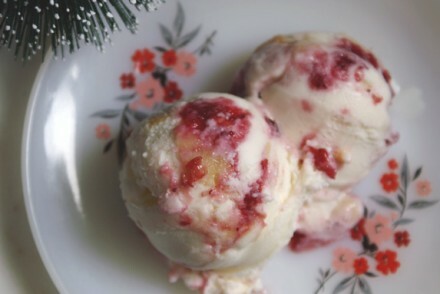 I was curious if you have made the almond raspberry layer Momo cake? Which is your favorite flavor you have made? p.s. My first double batch of crumb ended up ALL OVER THE FLOOR. Sad sad day. Please help! I need to make this today for next weekend and I know it says and you say u can freeze it for up to two weeks but how do I do that? Do I leave it in the ring I’d guess? Do I wrap the entire thing In something? What do you suggest I use to wrap it??? Thank you !! farmers’ market monday: summer lemon-vegetable risotto.